Ezra Parzybok says his book aims to clear up confusion about medical marijuana. Cannabis consultant Ezra Parzybok is shown Oct. 18, 2017 in his Northampton office. 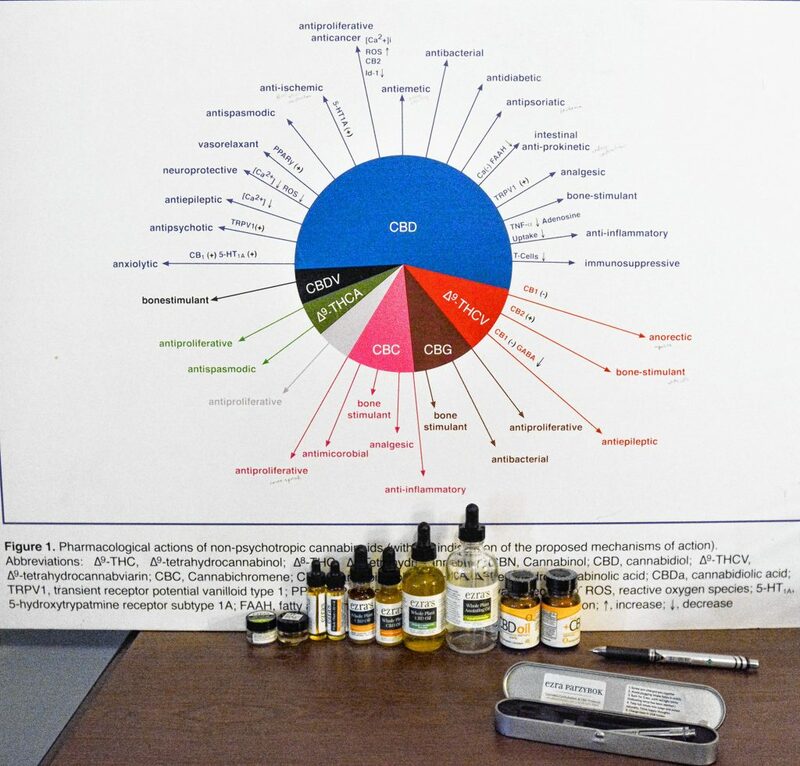 Parzybok points out that medical marijuana is available in a host of different forms, strengths and varieties. 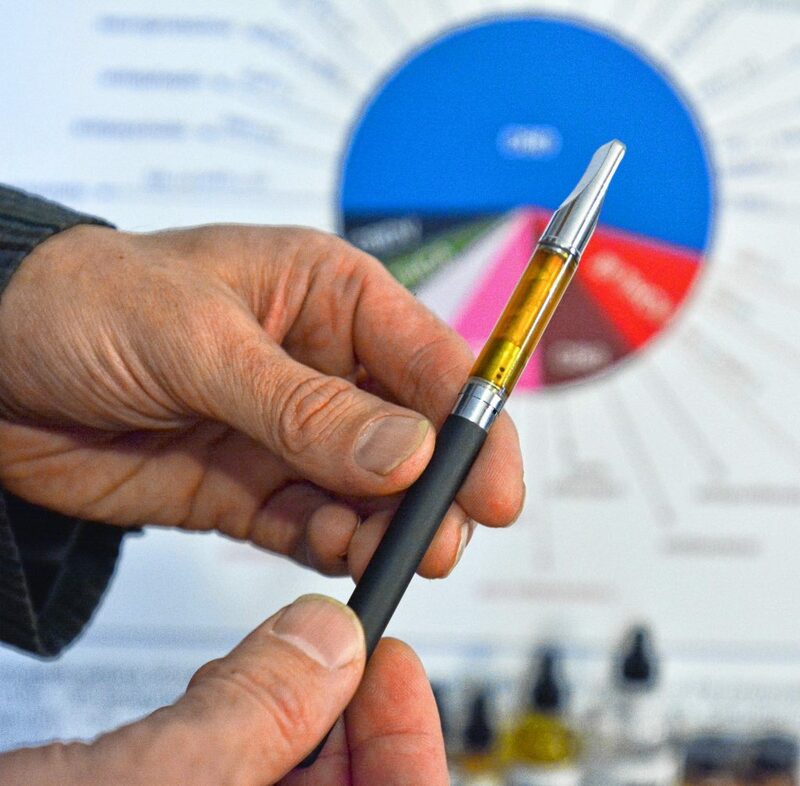 Ezra Parzybok holds a vape pen used for inhaling CBD at his home office in Northampton. 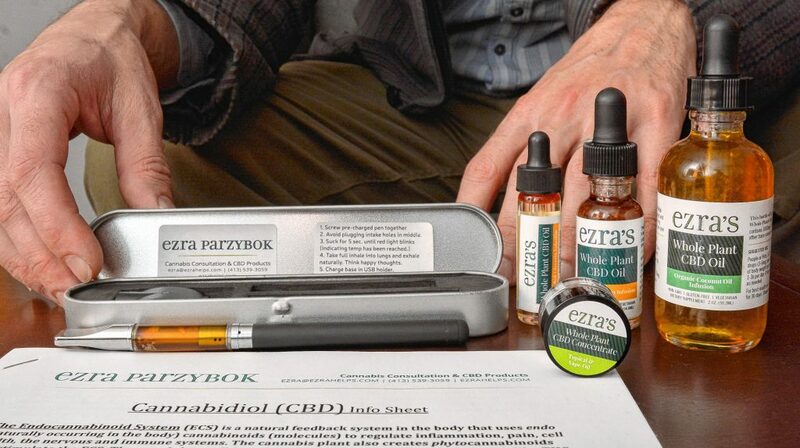 Ezra Parzybok makes medicines using CBD — Cannabidiol — a cannabis compound that can relieve problems such as anxiety and chronic pain without making the user high. Parzybok says he not only makes marijuana medicines, but teaches clients how to use them. 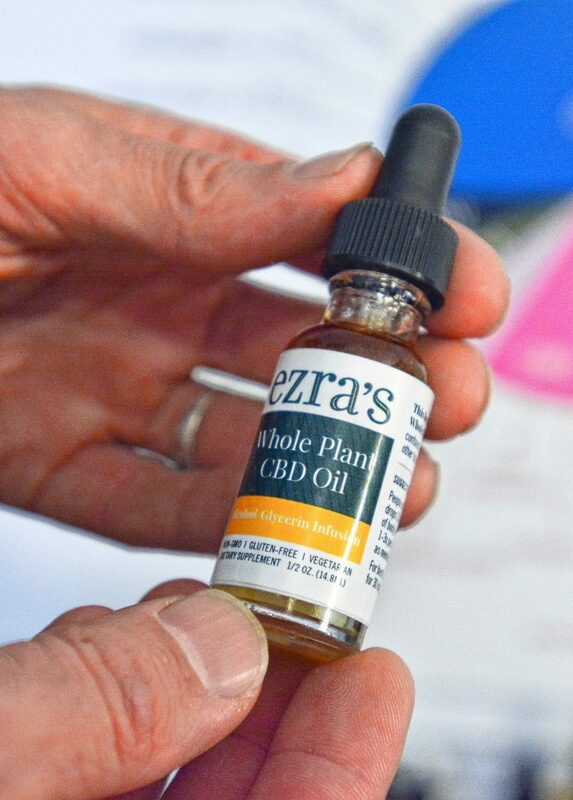 Ezra Parzybok displays his CBD products at his home office in Northampton. As its medical uses evolve and marijuana becomes legally available for recreation in Massachusetts, an area cannabis consultant is working to fill an information hole he thinks is undermining its use. 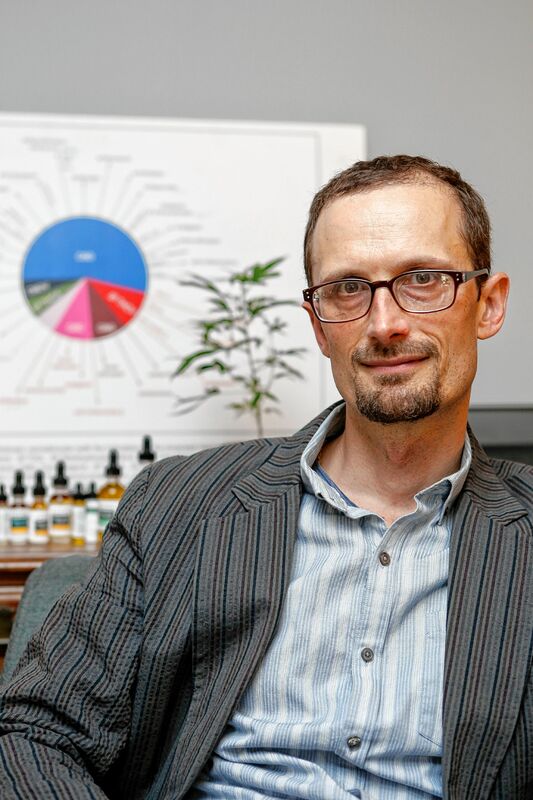 Parzybok, 43, whose book is scheduled to be released in July 2018, is a former teacher, certified as a cannabis consultant through the online Holistic Cannabis Academy. He has been researching medical marijuana, its effect on the body, and its various applications for the last five years. Parzybok is inspired by what he sees as a troubling lack of knowledge that affects the way that marijuana is regulated, dispensed, used and abused. “Between the federal stance on cannabis and the stoners who have been growing and using marijuana for years, there is an enormous gap,” he said. Parzybok believes science-based information can bridge that gap and enable potential users of medical marijuana, caregivers, parents and physicians to make informed decisions. Focusing on marijuana’s ability to alter a user’s mental state stands in the way of exploring its medicinal properties such as easing pain, anxiety and insomnia, Parzybok says. A report issued earlier this year by the National Academy of Science Engineering and Medicine notes that while many studies have examined cannabis use, results have not effectively reached policy makers, health care providers and state health officials. This, says Parzybok, has led to confusion and frustration. “In the state of Massachusetts, there are no regulations requiring doctors to understand dosing or to know advanced medical marijuana techniques,” he said. When a patient receives a medical marijuana certification card, Parzybok points out, there is no accompanying guidance on what kind to buy, how much to use or when to take it. There are a slew of varieties developed to produce different medical effects, he says, and the drug is available at dispensaries in myriad forms including tinctures, edibles, capsules, lotions, suppositories, vaporizer cartridges and plants. Patients also can choose among marijuana products that contain varying degrees of THC — Tetrahydrocannabinol, the chemical responsible making users feel high, or CBD — Cannabidiol, a cannabis compound that can help patients with problems such as epilepsy, anxiety and chronic pain without making the user high. While these products are available at 12 dispensaries across the state the information that staff at these centers provide is relatively sparse, he says. Leigh Dunlap, 55, of Florence, who uses marijuana to ease her symptoms from fibromyalgia, has struggled with that lack of information. Her illness affects her muscles and soft tissue causing widespread chronic pain, fatigue and sleep problems. Dunlap says she is still looking for the right strain and dose to manage her symptoms. That is where Parzybok, through his consultations with individuals and organizations and his writing on the topic, is hoping to help. It was his interest in marijuana as a medicinal herb to ease his own anxiety that prompted him to educate himself by poring over available research published in peer-reviewed scientific journals, he says. A random experience with some marijuana that was offered to him by a neighbor is what opened his eyes to its benefits. While his background is in the arts, and he has no formal education in medicine or science, Parzybok says his passion for the analytical comes from his experience as an artist. He was trained, he says, to approach a piece of artwork with a non-judgmental and inquisitive eye in order to understand the artist and the work without cultural bias. He has taken the same approach to marijuana, he says. He believes the fact that he was never a recreational user also gives him a purer focus on its medicinal merits. So, in 2012 when Massachusetts voters backed a measure allowing medical marijuana to be sold in the state, he got his medical marijuana card and set out on a new career path which included testing his own medicines made from strains of marijuana that he grew at his home. “I have spent a lot of time formulating remedies, learning what works, what is safe and what is unsafe,” he said. 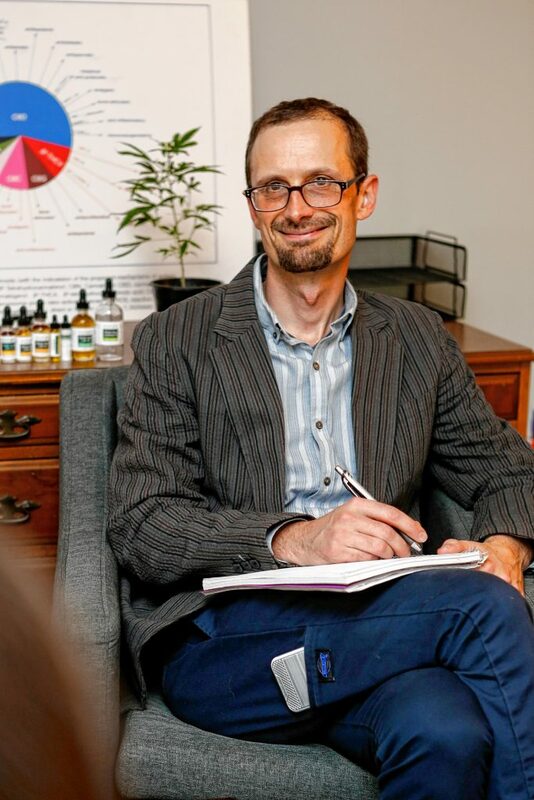 As a certified consultant Parzybok is not allowed to give medical advice or make recommendations to his clients, but he can explain the science and effects of marijuana on the body, he says. He focuses on relieving clients’ symptoms and reducing their use of powerful painkillers that have harmful side effects. Parzybok says he has found that a large number of people who seek him out are women over 50 who have turned to medical marijuana after having explored numerous other treatment options and medications for their ailments. He attributes that to complex medical conditions such as hormonal issues, joint pain, and cancer-related symptoms as well as their discomfort in visiting a medical marijuana dispensary. “Some have been to a marijuana dispensary and haven’t felt the guidance is sufficient,” he said. Plus the atmosphere and lack of privacy may be off-putting, he says. According to Parzybok, national statistics show that most of the people using medical marijuana dispensaries are 20- to 30-year-old males. At his office, he says, he offers a gentler approach. In addition to patients, Parzybok says, he sees caregivers for family members with medical conditions and parents who have questions or concerns about their children’s marijuana use. While he is an advocate of medical marijuana, Parzybok believes that the widespread use of recreational marijuana can create problems. Marijuana does not cause a physical addiction like powerful drugs, such as opioids do, he says. However, it can cause an emotional dependency to the euphoria and the ritual of obtaining it in those who use it simply for the purpose of frequently getting high, he says. “People can get into a medicated loop where they smoke marijuana and their anxiety goes away, but the next day it comes back stronger so they smoke even more,” he said. 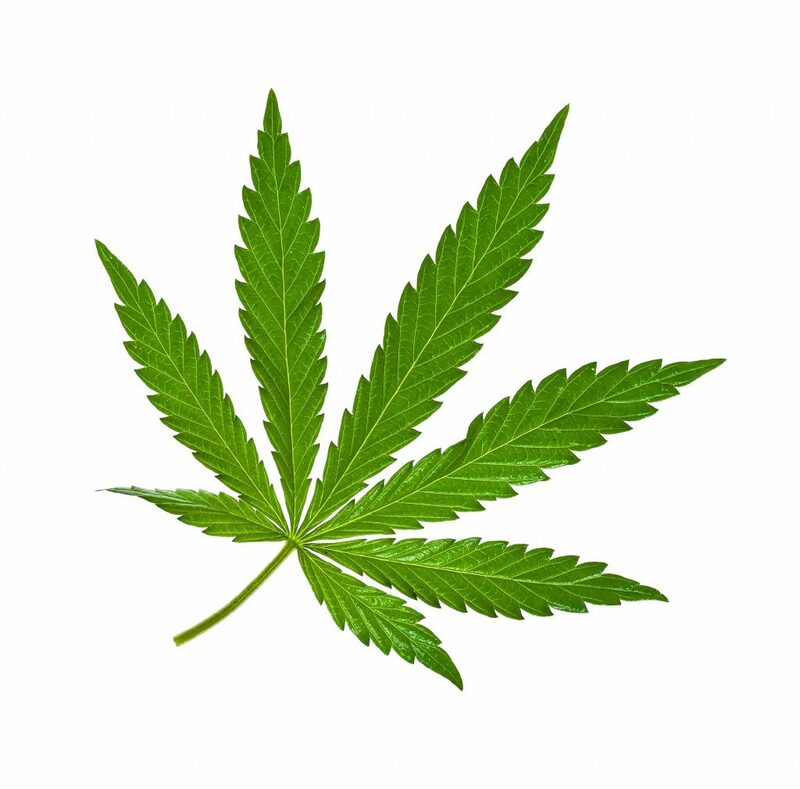 Parzybok says that marijuana also can have a paradoxical effect on the user causing, rather than relieving, anxiety, though those incidents are not psychotic, as some opposed to marijuana claim, and not long-lasting, he says. “If people have been diagnosed with a psychotic disorder, yes, cannabis can exacerbate that, but it can also help as well, depending on how its used,” he said. 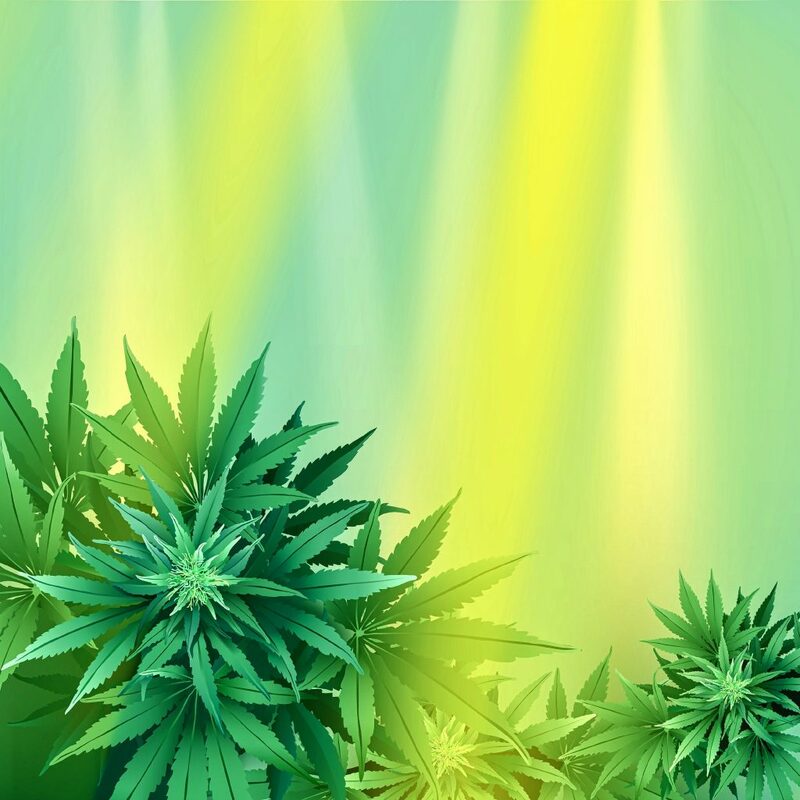 Parzybok’s practice has changed in recent years from working with marijuana containing the mind-altering THC to the strain that has just CBD – the cannabis compound that relieves various ailments without the euphoria. The shift came after his arrest in 2015 for growing and selling the substance. Parzybok’s home was raided after a National Guard helicopter spotted cannabis plants growing in his yard and he was summoned to court. Though medical marijuana had been legal since 2012, he says, there were no dispensaries open until the fall of 2015, which left patients permitted to use it with no legitimate place to buy it. While marijuana containing THC was and still is illegal for an individual to sell, Parzybok had begun giving it to those who asked for his help, and eventually he started accepting donations. “I knew that I was pushing the envelope,” he said. After he provided numerous letters of support to the court, the judge was convinced that he was dedicated to providing a safe way for patients to receive medical marijuana for legitimate ailments. He was given 90 days of probation. The incident, he says, had a major effect on his life. He stopped his business for about six months, he says, and spent a lot of time looking for other jobs. People continued to seek his help, however, and friends finally convinced him that there was a need for his services, he says. He decided to learn more about CBD and build his business around that. “I am happy that I stuck with it and believe even more so that medical marijuana is appropriate and can really help,” he says. But he still creates and sells medical-grade remedies. His whole plant CBD infusions are designed to reduce symptoms caused by fibromyalgia, insomnia, IBS, ADHD, hormonal issues, inflammation and toning the nervous and immune systems without side effects. Sold under the name Highend Health, these products can be seen on his website at ezrahelps.com. Ezra Parzybok can be reached by calling 539-3059 or emailing ezra@ezrahelps.com. His book “Cannabis Consulting: Helping Patients, Parents, and Practitioners Understand Medical Marijuana” published by University Press of New England, Lebanon, New Hampshire, will be available at Amazon.com and in area bookstores in July 2018.